How we deal with the summer heat is a pretty funny thing: Everyone knows it’s coming and what it feels like, but we’re rarely prepared for it. For example, I live in the northeast, where it hasn’t been too warm lately. This weekend, however, it looks like the temperatures are going to climb. And I’m sure I’ll hear plenty of people complaining and asking how it got so hot all of a sudden. And, more seriously, there will likely be reports of heatstroke or sunstroke. It’s just part of the seasonal life cycle, it seems. But don’t let the rising temperatures catch you off guard! Your body does have natural defenses against the summer heat, but they actually work better in dry climates like Arizona and California. Sweat, for instance, is your body’s way of keeping you cool. Water in the skin comes out and it evaporates, offering a natural form of climate control. But in humid states like Louisiana, Texas, Florida, and New York, the effect is quite different. Because of the moisture in the air, sweat doesn’t really go anywhere. This is why humidity can feel so heavy and oppressive. Just as your muscles activate to keep you warm when cold (shivering), your body slows down in the heat. You’re basically the opposite of solar powered—when it gets too hot, the energy levels drop. So, in order to avoid sunstroke, one of the best things you can do is to avoid straining yourself. Move slowly, sit down, and take some time to stop and smell the roses. Staying hydrated is also extremely important when dealing with direct sun exposure and high temperatures. And so is making sure you’re taking in enough sodium. Sweat causes you to lose electrolytes, which are very important to how your body feels and functions. You can hydrate with pickle juice, if you like—it’s very high in electrolytes. Or, you can opt for a better-tasting sports drink like “Gatorade” (just be sure to choose a reduced-sugar option). This might sound boring, but staying indoors during peak sunlight hours is also a good idea. 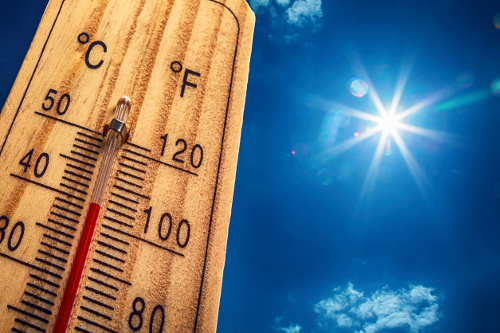 Heatstroke can set in relatively quickly during primetime sunshine (between 10 a.m. and 2 p.m.) so be careful. If you have to be outside, stay hydrated and find shaded, cool areas for relief. When you get too hot and suffer hyperthermia, your body’s internal processes can start shutting down. And it can lead to potentially serious consequences. So keep the water handy (and some pickle juice! ), stay in, and don’t let the heat surprise you this summer.